Keeping your kids’ toys and games organized is a difficult task, but board games, in particular, are especially hard to keep in order. On top of the small pieces and piles of cards, most board game boxes don’t last the test of time. Which means all those tiny components usually end up spilling out each time you put your games away. If you’re hoping to get a handle on your family’s board game collection, you’re in luck! I have 15 amazing board game storage ideas to help you get the board game clutter in your house under control. Families with an extensive board game collection need to check out this amazing DIY storage unit. 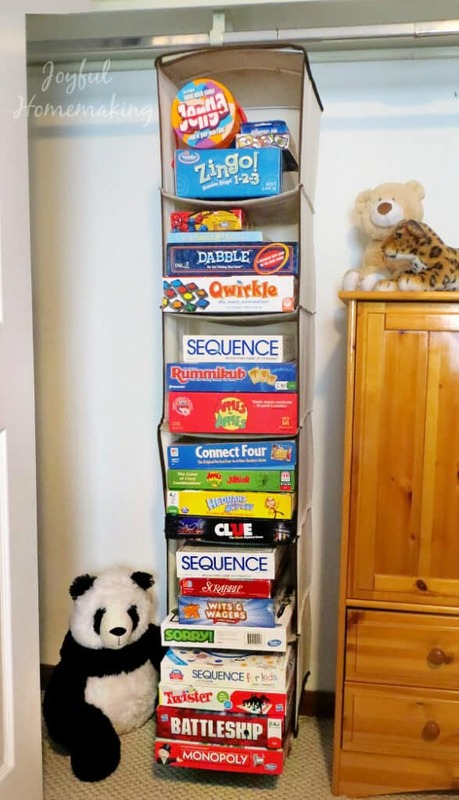 In addition to featuring game-friendly storage shelves, this genius unit also includes pull-out shelves perfect for keeping all of your family’s games neatly organized. You can find more information at Home Made by Carmona. If creating your own DIY storage unit isn’t in the cards for your family, consider purchasing a shelving system for your home. Cube storage shelves are a great option for storing your family’s games. The game boxes fit perfectly inside the cubes, making it simple to stack each box while also keeping it within easy reach for your next game night. While having your games on display is great for playrooms, sometimes you’d rather hide away toy and game clutter. To keep your family’s board games organized but out of sight take a cue from Joyful Homemaking and hack a hanging closet organizer. While this set of hanging shelves is typically used for bulky clothing items, like sweaters, it also works well for storing away game boxes. You can find more info at Joyful Homemaking. One of the biggest issues with organizing board games is keeping all the small components in order. 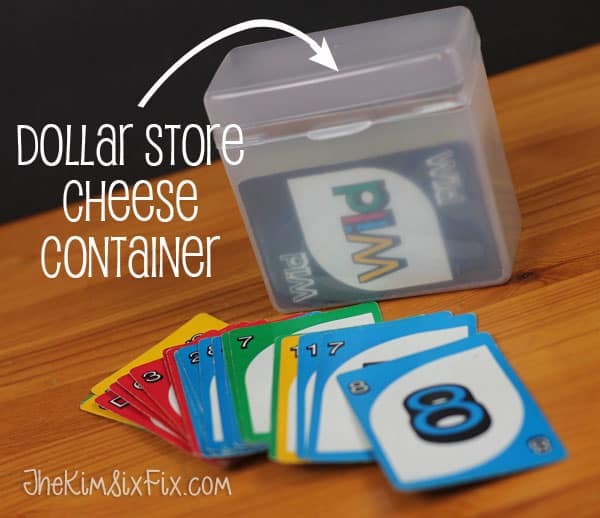 The Kim Six Fix has tons of great ideas on how to store board game components. My favorite is her use of a dollar store cheese container to store game cards. Check out her other ideas at The Kim Six Fix. If you can’t find a cheese container at your local dollar store, consider grabbing a set of these collapsible storage bowls. They’re perfect for storing small game pieces. And they collapse into flat discs when they’re not in use, so they don’t take up any extra space when you don’t need them. Another great way to keep small game pieces secure while you store them is with a set of small plastic storage cubes. These little boxes can even be stored inside your game boxes to keep all the pieces from rolling around inside the box. That will ensure you never lose a game piece from your favorite game again! If you don’t have a dedicated storage shelf for your games, storing them upright is a space-saver. But it’s difficult to store game boxes upright because the lid tends to fall off. 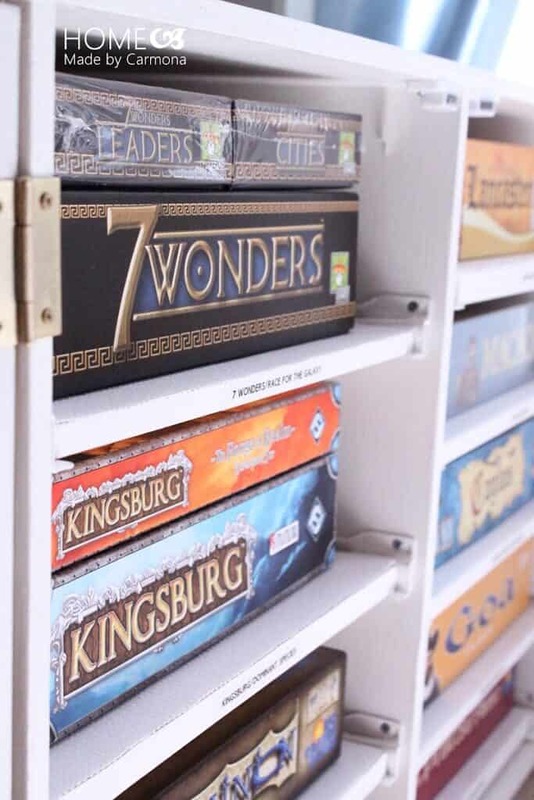 To keep your games from opening when you store them, consider wrapping headbands around the boxes – see how at The Complete Guide to Imperfect Homemaking. While headbands are an ingenious storage hack, you can also purchase box bands especially designed for keeping your game boxes together. These game box bands will make it easier to store all of your board games without getting rid of their boxes. 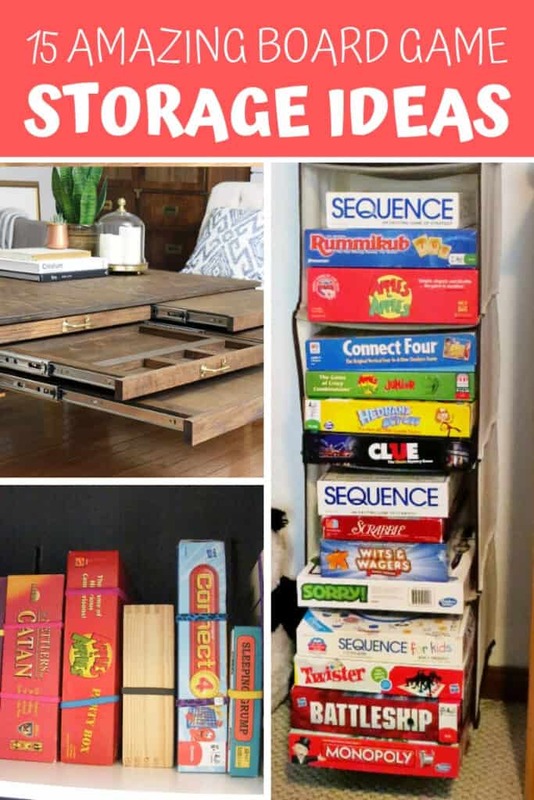 DIYers will love this board game storage option, which allows you to store the board games right where you need them – in the coffee table. The amazing selection of pull-out drawers provides plenty of space to store all your gaming needs all in one easily accessible space. You can find out more about this amazing table at Home Made by Carmona. 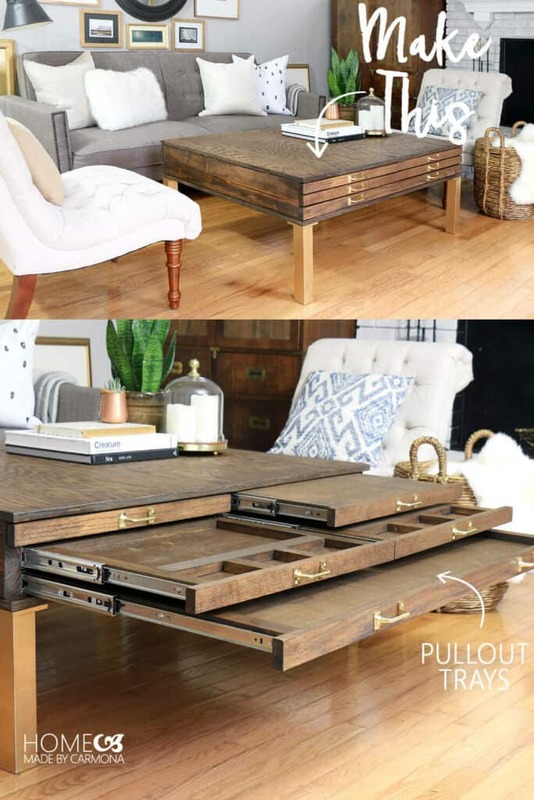 But not all of us have the DIY gene, which is why this awesome coffee table with built-in storage is another great choice for board game loving families. You can easily store your favorite board games in the bottom storage space, keeping them nearby whenever you feel the need to play. Get all the info you need to get your puzzles and games under control with this informative post from Clutter Keeper. It’s full of great information on how to store your games, in addition to helping you declutter your collection to make sure it stays organized. If your board game boxes are beyond repair, you don’t need to toss the whole game! 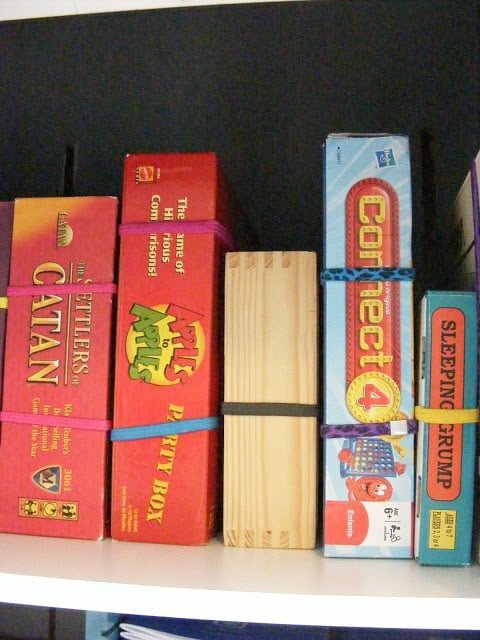 There are several ways you can store your board games without the box. Clear plastic pouches are great for keeping all the pieces to your games in one handy place. Just place the board, pieces, and instructions inside the pouch and store the pouches in a box to keep them organized. Clear storage boxes are another great option for board games without a box. If your favorite board game box is looking a little worn, simply take the pieces and board out of the box and transfer everything to a clear storage box. Next, cut the side of the board game box that says the name off the box and tape it to the side of the clear storage box so you’ll know which game is inside. Finally, be sure to cut out any instructions from the box and store it inside your storage container for easy reference. 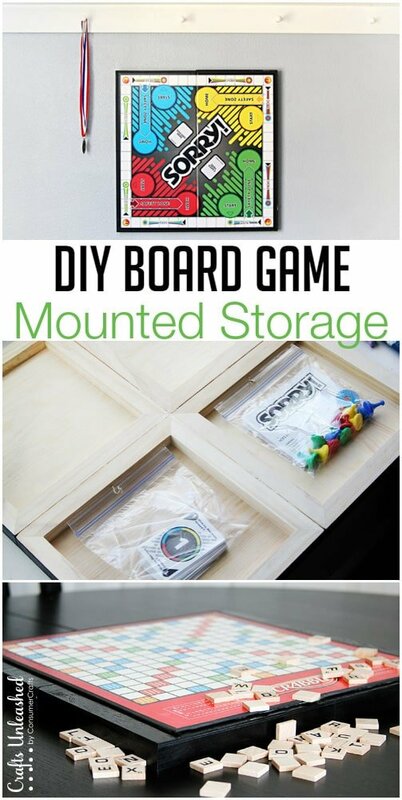 This amazing DIY project is great for families who really love board games. Put your love of games on display by turning the board into art! And the best part about this storage solution is that you can decorate your room and still play the games when you want. Just take the board off the wall and pull the bag of pieces off the back to play a round. Check out more about how to make this cool wall storage solution at Crafts Unleashed. For a simpler storage display option, consider placing your board game and corresponding pieces inside a shadow box frame. Simply measure the size of the game board and find a frame that fits that size. Then place the board in the frame to display it, while also placing all the piece and instructions inside behind the game board for later use. If you found this helpful – make sure to pin this post!